Anne-Claire Petit (Breda, The Netherlands, 1962) studied industrial design in Eindhoven, where she specialised in textile design. At the academy, she became interested in handicrafts such as printing, weaving and crochet. Her present style and collections still reflect her love for traditional craftsmanship. The start: shawls and fashion accessories After finishing her studies Anne-Claire began her career in 1986 as a designer for Esprit. The four years at this international label prepared her for the plunge she took when starting her own company. 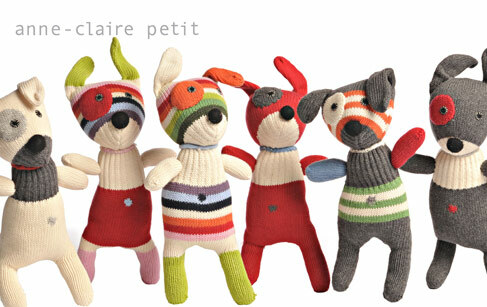 Soon, Anne-Claire Petit Accessories as she named it, became well-known for its shawls and other fashion accessories. Her unbridled creativity led to new products and techniques and a growing collection. Kids & home collection In 2002 Anne-Claire chose to shift her focus to a kids & home collection. Without the seasonal cycle of fashion, she feels free to create and to translate her love for colour and natural materials into a wide variety of items. As the objects became bigger and bolder over the course of time, these grew into two separate lines: Anne-Claire Petit Accessories, consisting of toys and playful accessories and Anne-Claire Petit Home with its furniture and decorative objects for the home. Made to last With all the love and energy put into the objects by her and by the women who do the handwork, Anne-Claire believes they are made to be cherished for a long time.